The Assyrian Church of the East Relief Organisation (ACERO) has become aware of recent claims broadcast in a number of Assyrian-American media sources pertaining to the release of Assyrian hostages held in north-eastern Syria from February 2015. These claims have included suggestions that members of other churches, politicians and/or others have helped with efforts to bring about the release of our people. In response to such claims, ACERO takes this opportunity to affirm that these claims are totally unfounded and without truth. As such, we ask kindly that the individuals who made and the media organisations who broadcast these false and untruthful statements retract them without delay. Such fabrications are irresponsible and could have consequences to the people making them. By way of our Facebook page, website and other social and mass media, ACERO has always released accurate and timely information relating to the matter at hand on a breaking-news basis. This information is still available online and a matter of public record. It is the only accurate information on these matters. ACERO urges caution and prudence from all persons in relation to these matters given their sensitivity and direct and indirect impact on the lives of Assyrians and other ethnic and religious minority groups in the Middle East. ACERO takes this opportunity to thank the following people and organisations who have helped our Assyrian people in these difficult times. Firstly, we extend our thanks to thank all individual donors, who make donations directly, either online or through direct payments. These donors include Assyrians as well as many non-Assyrians from around the world who wish to show their support and offer help to our people. We would also like to thank the many social, church-based and political societies in Assyrian communities around the world who have provided support over the past year and more. In addition, we are grateful to all of the non-Assyrians organisations, including charities like The Barnabas Fund, who helped our people in these most difficult times; particularly in providing much-needed help for those who have had to flee their towns and villages. ACERO would truly not have been able to achieve what it has without this support. 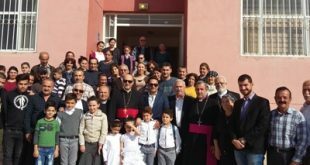 Finally, ACERO is grateful to all of the parishes, clergy and prelates of the Assyrian Church of the East who have lent the hand of support to our church and people in Syria and to His Grace Mar Afram Athneil, Bishop of Syria, in the matter of the release of Assyrian hostages. They have done this by providing housing and household supplies, food, medication and clothing to settle those persons who have lost everything. ACERO’s Trustees, Executive Committee and Chapters around the world are indebted to His Grace Mar Afram Athneil for his tireless and selfless dedication to his suffering flock in Syria and pray for the health of his body and spirit that he may continue to give able leadership to our suffering people. At the same time we send our condolences to the families of Assyrians and all others who have lost their lives in Syria. We pray that those innocent people who remain unaccounted for return to their loved ones without delay.